When we last checked in with the Ptah-Sokar-Osiris figure, I was working on finding a satisfactory cleaning approach. 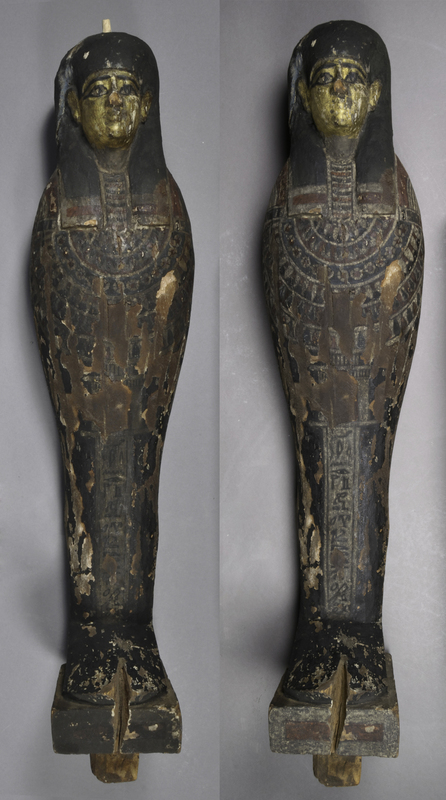 The figure has a darkened layer over the front surface, which obscures the beautiful patterns, colors, and hieroglyphs. My goal for cleaning was to clarify designs and improve legibility, although the sensitivity of the paint layers has made this an interesting challenge. After cross-section analysis, I looked into instrumental techniques to better understand the condition issues. One promising technique was gas-chromatography mass-spectrometry (GC-MS) since the darkened layer was potentially a coating material. I took a sample by swabbing the dark layer from the wood substrate. Since only a small amount of material can be gathered this way, I collected several swabs in a glass vial for analysis. I sent this down to Winterthur Museum’s Scientific Research and Analysis Laboratory (SRAL), which has previously collaborated on samples from the Artifact Lab. Dr. Christian Petersen, a GC-MS specialist, sent back my spectra with some interesting results. He described the mixture as “waxy dirt,” which helps to clarify what likely happened to the surface. 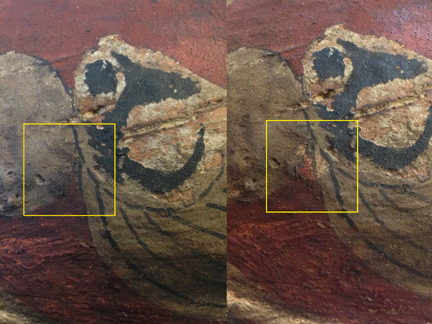 Wax may have been applied to consolidate the badly flaking paint, and this layer could have trapped dirt over time as the figure rested face-up in storage. Focusing on the wax component did not immediately produce better cleaning results, and I continued testing gels with variations on solutions, application method, and timing. I eventually tried an application of Pemulen TR-2 gel, a polymeric emulsifier, with a proportion of solvent added. This gel was more effective for lifting the waxy grime and did not require excessive action on the surface. Used along with a silicone solvent barrier layer, I was able to lightly clean without lifting pigments from the surface. While I had some initial ideas about cleaning, this method was something that I only found through the process of trial and error. Even though I cleaned slowly in very small sections, the actual treatment step took much less time than the research, testing, and planning phases. Take a look at the results below. Aside from cleaning, a few other steps were taken to stabilize the statue. The headdress, which is constructed from multiple pieces of wood, had a large gap that allowed the pieces to move individually. To add support and decrease movement, removable fills were made from Volara foam and Japanese tissue. 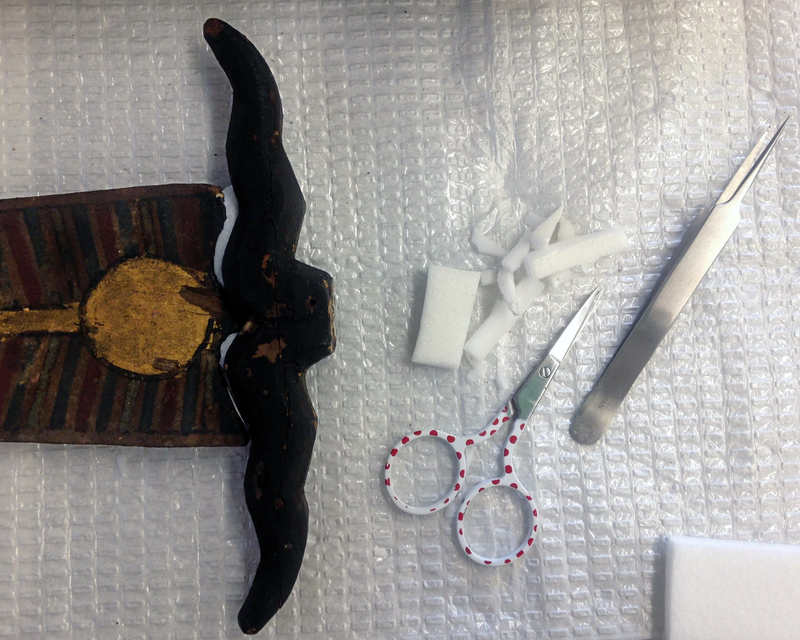 These materials were turned into small “pillows” that were then pressure-fit into place. The figure, headdress, and base do not fit together in a stable arrangement. Instead of intervening further with the object itself, an exterior mount will be constructed to hold the components in place. This method has worked well with a similar Ptah-Sokar-Osiris figure, which you can see displayed in the Upper Egypt Gallery! 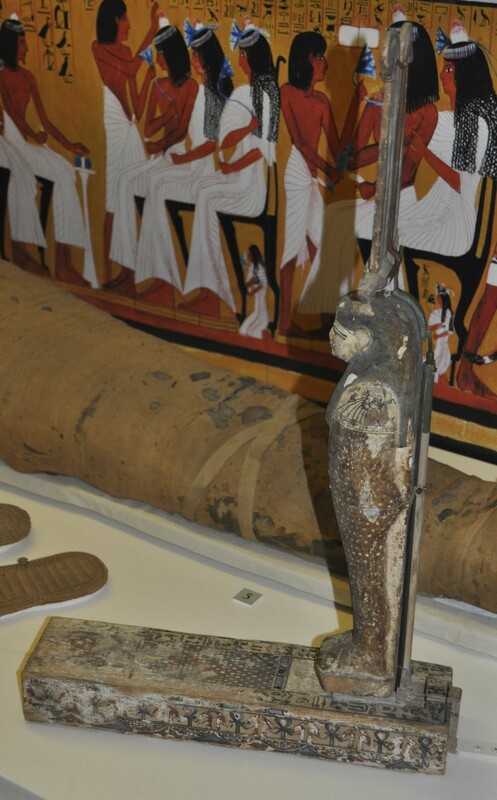 Another Ptah-Sokar-Osiris figure on display in Upper Egypt, showing the back of the figure and the mount holding the three pieces together. Overall, this project provided quite a few challenges and an opportunity to explore cleaning techniques. Thanks for following along on this experience with Egyptian painted surfaces!